1. If games for Spring Season are rained out will they be rescheduled? No, if games are cancelled for any reason, including rain, they will not be rescheduled. 3. Is my child the right age for AYSO soccer? We offer programs for all children ages 3-18 years old. Please see the Division Birth Date chart for specific age group eligibility . 4. What makes AYSO different? 5. What other soccer expenses can I anticipate this year? Not included in the registration fees are the required shin guards, appropriate shoes, and a strongly recommended practice ball. In addition, the team parents will possibly request a small amount to cover the expenses of a team banner, hair pieces (for the girls), end of season team party, and a small gift for the coach. Also, each family is often requested to bring snacks for the team at one game during the season. 6. My child does not meet the minimum age range for the AYSO Fall season, but he/she is very [big/strong/athletic/coordinated] for his/her age. Can we still sign up for the upcoming Fall season? No. AYSO is a national organization with very strict guidelines regarding age requirements. AYSO's accident and liability insurance depends on the players being the proper age to play and being placed in their age appropriate divisions. Children who do not meet the age requirement are not permitted to play. Be patient – they'll grow up before you know it! 7. In school, my child is with classmates who are [younger/older]. May my child "play down" in a younger division or "play up" in an older division to be on teams with kids with whom he/she goes to school? No. AYSO is a national organization that determines the player divisions based on birthdates. The AYSO "year" runs from August 1st through July 31st. 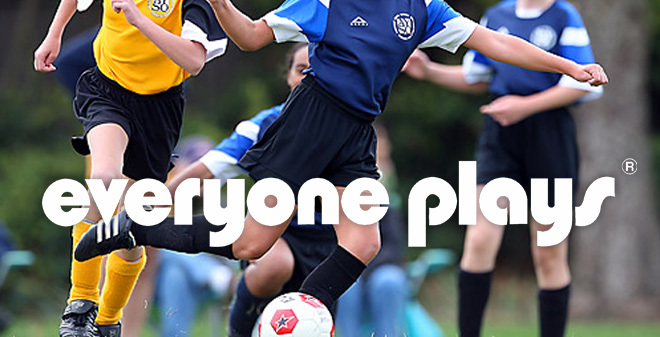 AYSO's accident and liability insurance depends on the players placed in their age appropriate divisions. Many children are in "different" divisions than their school classmates. We encourage you to view this as a positive experience - it will allow your child to broaden his/her relationships outside of school and enjoy making new friends. 8. What is the duration of the games? 9. What should I bring to my child's practices and games? 10. Do I have to get soccer shoes for my child to play? 11. What size soccer ball should I get for my child? 12. Why are the children required to wear their soccer socks over their shin guards? 13. Is it OK for players to wear jewelry during practice and game? No. Jewelry of any kind (necklaces, watches, earrings, rings, bracelets, etc.) cannot be worn during practice or games. 14. The doctor said that my child can play with his arm splint. Will AYSO allow him/her to play? No. While the doctor may be representing your son's interest appropriately, the risk to other players mandates that he limit his participation to that of moral support on the sidelines. Players may not wear casts or splints which could possibly cause injury to himself/herself or another player. NO EXCEPTIONS. This applies at the games as well as at practices. 15. What about eyeglasses and hearing aids? 16. It can be cold during the early morning Fall season games. Can my child wear a sweatshirt during the games? Any extra articles of clothing must be worn under the uniform (so you can still determine which team a player is associated with). It is recommended that any extra articles of clothing be limited to undershirts or turtle necks (under the uniform). Try to coordinate with your team's colors if possible. Any extra articles cannot have any zippers or any plastic/metal components of any kind. 17. What kinds of hair accessories are acceptable? Any hair accessories should not be made of metal or plastic, and should not be rigid. Soft hair accessories such as "scrunchies" and soft rubber bands are recommended and acceptable. 18. What is the refund policy for AYSO Region 39? Any player who withdraws from the program shall be entitled to a refund of such registration fee. Specific dates below shall be adhered to in order to correctly respond and apply refund requests. The refund dates have taken into consideration unrecoverable costs which may include but are not limited to player insurance, uniforms and other such fees. Please note, the National AYSO Membership Fee of $20.00 is not refundable under any circumstance; your agreement to this policy was acknowledged when you registered your child. Therefore any refunds issued will be less the $20.00 National AYSO Membership Fee. To notify the Region that you wish to withdraw your child from the Fall 2019 Season and to request a refund, CLICK HERE. You will be required to complete the Refund Request Form. Forms are timed stamped when submitted electronically. NO Refunds will be issued to players who have participated in practice before the start of the first game - no exceptions. Refund Policy rules apply for those parents requesting refunds for not being placed with a specific coach, a specific practice location, or understanding that Spring season is only played on Sunday. Entire Uniform (Jersey, Shorts & Socks) must be returned unused if distributed. * NEW Players are considered players who did not participate in the 2019 Fall season.